The Fourth Annual Nitrogen: Minnesota’s Grand Challenge and Compelling Opportunity Conference will be held February 6, 2018 at the Rivers Edge Convention Center in St. Cloud, with registration beginning at 8:15. Attendees can expect to learn more about cover crops, tile drainage and on-farm testing to improve profitability and water quality. Speakers include Dr. Matt Helmers, Iowa State University; Dr. Howard Brown, Illini FS; along with several University of Minnesota researchers. Click here to register. This year marks the tenth Annual Nutrient Management Conference. Conference will be held February 20, 2018 at the Verizon Conference Center in Mankato, with registration starting at 8;15. Sessions will cover trends in phosphorus and sulfur management, in-season nitrogen applications and cures for phosphorus runoff losses from farmland. Dr. Don Flaten, University of Manitoba and Dr. Emerson Nafziger, University of Illinois will be joined by Minnesota researchers. Click here to register. 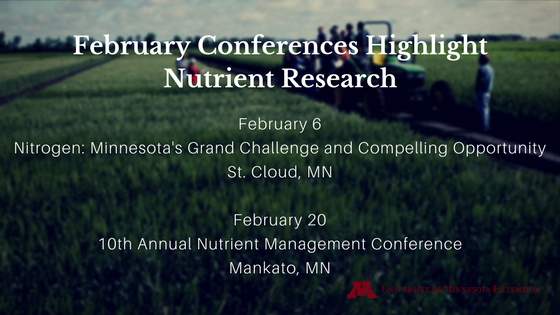 Hosted by the Minnesota Agricultural Water Resource Center and University of Minnesota Extension along with the Minnesota Department of Agriculture and several other sponsors, the two conferences continue a partnership effort that has grown in recent years and attracts several hundred attendees. Several presentations will provide updates on research funded by the Agricultural Fertilizer Research and Education Council, an industry-led program funded through an assessment on fertilizer sold in Minnesota. Learn more about AFREC here. Certified crop advisors will earn continuing education credits in nutrient management and water quality. To register, go to http://mawrc.org/events/. Online registration is encouraged but not required. Conference registration is $20 up to one day prior to the event, which can be paid online (requires a $3.16 service fee) or at the door by check or cash. On-site registration is $25, payable by cash or check.